Heart murmurs in dogs are something that would rightly cause great concern for any owner whose beloved canine pal has been recently diagnosed with. If your dog has been diagnosed with a common heart murmur problem, it may be a sign of canine cardiac disease. Treatment for heart murmurs in dogs exist, if properly diagnosed and detected in a timely fashion as experts told us. Dog heart anatomy: from left. 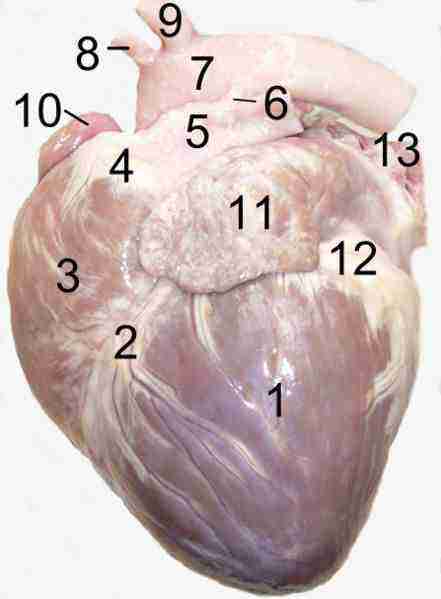 1 left ventricle, 2 paraconal interventricular groove, 3 right ventricle, 4 arterial cone, 5 pulmonal trunc, 6 arterial ligament, 7 aortic arch, 8 brachiocephalic trunc, 9 left subclavian artery, 10 right auricle, 11 left auricle, 12 coronal groove, 13 pulmonal veins. Cardiology is an exciting subject and recent advances in therapy have improved not only the life expectancy of dogs with heart disease but also the quality of life. The most important factor is to recognize that the problem is cardiac in origin. The elderly animal with a cough and a heartmurmur must be examined and investigated thoroughly before assuming that the murmur and cough are connected. Overall incidence of heart disease has been estimated at 11 · 3% with the congenital type accounting for 0 · 5% (Detweiler & Patterson, 1965). Congenital heart disease should be detected early in life, and certainly no later than at presentation of the puppy for primary vaccination, but will only be diagnosed if the puppy is thoroughly auscultated. The more common congenital cardiac defects, in approximate order of incidence, are patent ductus arteriosus, pulmonic stenosis, aortic stenosis, persistent right aortic arch, ventricular septal defect, tetralogy of Fallot and atrial septal defect (Patterson, 1965). Early diagnosis is important as, particularly with patent ductus, surgery performed at an early stage can be curative. Looking at the guidance above, you'll see that early detection is crucial but treatment is viable if detected in time and given the proper surgical or medicinal intervention by a vet. Getting your dog back to good health with treatment will depend entirely upon the stage of the disease and how severely it has affected other parts of the body. If your puppy is young and has a congenital defect, it may be surgically removed. There are several possible reasons for heart murmur. One is that the puppy is born with a defect in his heart. Congestive heart failure in dogs is distressing but about 3 million dogs a year are diagnosed with it. While it cannot be completely cured, there are treatments that can be done that can help your dog enjoy a good quality of life nonetheless. Anemia caused by dog parasites can also be the cause of heart murmur in dogs. You must make it a point to bathe your dog regularly and comb his hair with a fine tooth comb to prevent parasite infestation. Mitral valve disease is another possible cause. High blood pressure, age or compounding heart conditions produce weakened mitral valves. The outcome of this is that instead of pumping blood out like it should, blood leaks to the atrium and the consequence is audible heart murmur sounds. This is the most dangerous cause and must be attended to as soon as possible. Be vigilant if your dog gets tired easily, has fainting spells and has difficulty breathing. These are a few signs of heart murmur. He will not want to eat and move around much. A dog with heart murmur will also likely have bluish/gray gums and have a problem with water retention. If you these behavioral and physical symptoms manifest in your dog, you must bring him to the vet for a check-up immediately. For every owner, ensuring your dog's heart is healthy is something you can do via regular vet check ups, observing your dog's day to day behaviour, paying particular attention to their energy and activity levels and providing the best nutrition for your dog's age, breed type and lifestyle. Having a dog diagnosed with a heart murmur is not the end of the world. Modern veterinary treatment and medicinal intervention can provide your dog with a management approach to this condition. The key is to be vigilant and make sure your dog receives the best medical attention possible (dog insurance would be a good investment for any dog owner, but particular those who own breeds susceptible to congenital health problems).